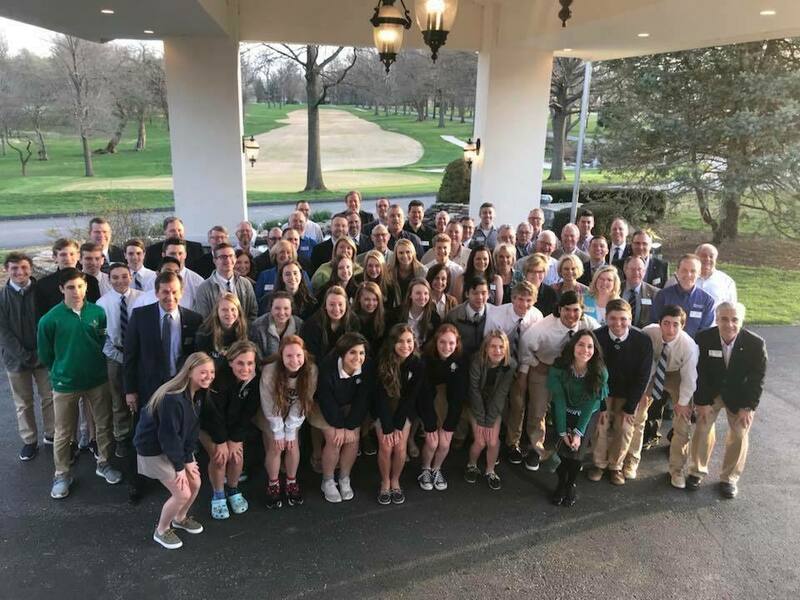 Springfield Catholic Rotary Interact (SCRI) was established in 2011 with 15 students willing to listen to a 15-20 minute discussion about making a difference in their community and their world. Susan Haralson and Doug Twigger of Sunrise Rotary attended the Rotary International Conference and came home “fired up about Interact”. They attended a session and heard young people discussing the great volunteer efforts they were engaged in through Rotary Interact. Rotary Interact instills the knowledge of what being a Rotarian really is…helping others, community giving and reaching across continents to extend a helping hand. A true worldwide vision of how they can make a difference. The first 15 students were amazed to learn Rotary took on the challenge to eradicate polio from the face of the earth…and after 30 years of fundraising and delivering vaccinations to children across the world, only 2 cases of polio were reported in 2017…we’ve almost accomplished this dream. We still have work to do but by working together, we’re almost there. Interact members learn about the 4 Way Test all Rotarians use in their daily practices; how it relates to every day decision making and by using the 4Way Test we can change lives. One or more Sunrise Rotarians attend every Interact meeting. Eric Lampe, New Generations Chair for Sunrise Rotary, has led SCRI officers in creating a memorable experience for all students involved. Each year SCRI membership has grown. Their volunteer efforts and fund raising have changed too. They have adopted children to support internationally, donated to polio plus, written cards and letters of encouragement to soldiers deployed fighting for our freedom. Locally, they support Rare Breed, Ashley House, Convoy of Hope, MDA and many other organizations through volunteer hours as well as financial assistance. This year, SCRI boasts membership of 100+…A true testament of the hard work and continued efforts in promoting their club to fellow school mates, incoming freshmen and expanding their efforts to educate parents as well. Springfield Catholic High School principal and teachers provide dedication and support to SCRI which contributes to their success. Since the creation of SCRI, they have been recipients of the Rotary District Presidential Award each year in recognition of their tremendous achievements and hope to be recognized again in 2019. They continue to be energized, compassionate and dedicated to the continued growth and success of their club. The Rotary Club of Springfield Sunrise members are extremely proud of SCRI and their many accomplishments. Each year SCRI members are invited to attend Sunrise breakfast meeting, starting at 7 am, and this year 56 of the SCRI members boarded a bus at 6:30 am to arrive for breakfast and attend our meeting. All four SCRI officers took time to present during the meeting to bring Sunrise members up to date on their efforts and successes of the2017-18 school-year. 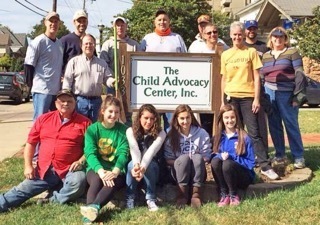 Maddie Gebhard, Shelby Boyer, Nikki Salathe, and Anna Galligos, all members of the Springfield Catholic Rotary Interact, volunteered at the Child Advocacy Center on Saturday October 17. The Child Advocacy Center is a place where young victims of abuse can come to safely and comfortably share their stories. 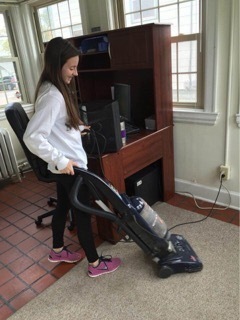 The Springfield Catholic Rotary Interact students worked with members of Sunrise Rotary to help vacuum, clean, and do yard work.